Blue zoisite - Tanzanite: Tanzanite is the most widely known zoisite and one of the world's most popular gemstones. This violetish blue tanzanite is an exceptional faceted oval weighing 8.14 carats and measuring 14.4 x 10.5 x 7.6 millimeters in size. On the basis of its color and clarity, it would be rated in the top 1% of the tanzanite produced by TanzaniteOne Mining Ltd., the leading producer of tanzanite. Photo copyright by Richland Gemstones and used here with permission. What are Zoisite and Clinozoisite? Zoisite and clinozoisite are minerals that form during the regional metamorphism and hydrothermal alteration of igneous, metamorphic, and sedimentary rocks. In those environments they are found in massive form and as prismatic crystals in veins that cut schists and marbles. They are also found as crystals in pegmatites that form on the margins of igneous bodies. The two minerals are dimorphs - they share the same chemical composition but have a different crystal structure. Zoisite is the orthorhombic form of Ca2Al3(SiO4)(Si2O7)O(OH) and clinozoisite is the monoclinic form. 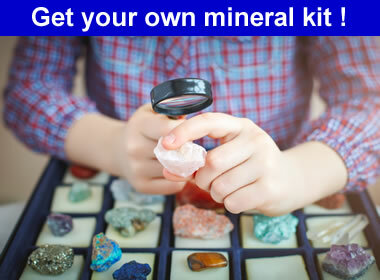 The minerals have extremely similar physical properties and can be very difficult to tell apart in hand specimens unless the specimens are well-formed crystals. Clinozoisite forms a solid solution series with the mineral epidote in which iron can substitute for aluminum. Zoisite: Shown above are 4 specimens of zoisite in unusual colors. Top row: pink and yellow crystals with orthorhombic crystal habit. 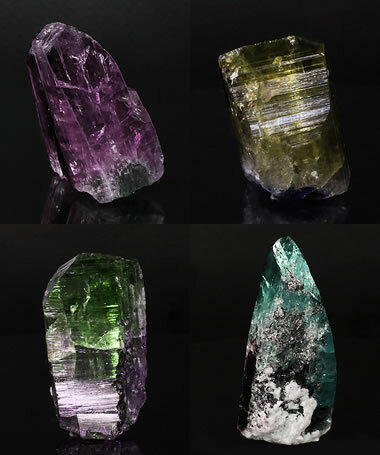 Bottom row: (left) a parti-colored specimen with shades of green and pink in the same crystal; (right) a blue-green crystal with nice termination. Specimens and images copyright by Lapigems. Zoisite and clinozoisite are minerals that are usually found in small quantities. They have not been used in significant amounts by industry. Transparent and colorful specimens of both minerals have been used as gemstones. Zoisite is the mineral of some very diverse gem materials, one being the extremely popular tanzanite which was discovered in the 1960s and immediately became one of the world's most popular gems. Tanzanite is the most famous zoisite. It is a transparent blue zoisite that is colored by the presence of vanadium. Some blue zoisite is found naturally, but most is produced by heat-treating brown zoisite. The heat changes the oxidation state of vanadium to produce the blue color. Tanzanite is the second most popular blue stone, after sapphire. It is a rare gem only found in one small area in northern Tanzania. Thulite is a pink, opaque variety of zoisite that is often cut into cabochons or used to produce small sculptures. It can be an attractive material but is rarely seen in commercial use because the supply is limited and the public is unfamiliar with the gem. 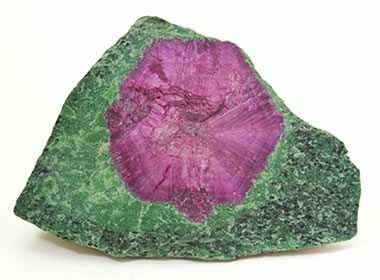 Thulite is an opaque pink variety of zoisite that is cut into cabochons and used to produce small sculptures. It is also a rare material, found in Norway, Namibia, Australia, North Carolina, and a few other locations. It is rarely seen in commercial use. Anyolite: Also known as "ruby in zoisite," anyolite is a rock composed of zoisite, with red corundum crystals (ruby) and often accented by black crystals of the hornblende, tschermakite. 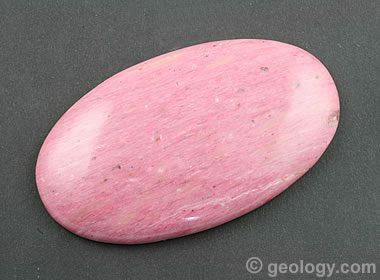 It is a rock that attracts attention and is cut into attractive cabochons and used to produce small sculptures. Image copyright iStockphoto / MarcelC. Anyolite is a very colorful rock composed mainly of zoisite. It is also known as "ruby in zoisite" because it is composed of green zoisite with bright red ruby crystals, sometimes accompanied by black crystals of the hornblende tschermakite. It is used to produce cabochons, tumbled stones, small sculptures and ornamental objects. Nice pieces of rough material are also sold as specimens. A material with a similar appearance, "ruby in fuchsite" is often misidentified as ruby in zoisite. Careful testing can easily differentiate these materials because the green fuchsite has a hardness of only 2 to 3, while the green zoisite has a hardness of at least 6. In addition, most specimens of ruby in fuchsite exhibit blue kyanite alteration rims around the ruby crystals, and this does not occur around ruby crystals in zoisite. Clinozoisite: Two views of the same crystal of clinozoisite from the Haramosh Mountains of Pakistan. The specimen is about 3.2 centimeters tall. Specimen and photo by Arkenstone / www.iRocks.com. Gem-quality crystals of clinozoisite are sometimes cut into faceted stones. It is considered to be a "collectors" stone because it is rarely seen in jewelry. Zoisite and clinozoisite have the same chemical composition. This gives them very similar physical properties, as shown in the accompanying table. The difference between the two minerals is in their crystal structure. Zoisite is a member of the orthorhombic crystal system, and clinozoisite is monoclinic. They are difficult to tell apart in hand specimen unless well-formed crystals are present. Optical tests and x-ray diffraction are the best ways to make positive identification.